Centuries ago the Black Paladin's paramour an evil witch, placed him in an enchanted slumber so that he might awake in the twentieth century to bedevil mankind once more. Now he seeks to return her to life to aid him in his schemes! With the help of the sorceress Talisman and some powerful new followers, he prepares for a ritual that will bring new evil into the world... unless you heroes can stop him! Shades of Black is an adventure for Champions that pits your heroes against the Black Paladin and his minions. In Act One, Murders Passing Strange, the heroes investigate a series of unusual murders that seem to have an occult connection... which leads to a confrontation with the Black Paladin as he attempts to kill another victim in a foul ritual! Information obtained during the investigation leads to Act Two, A Course Of War. As the heroes follow up on other clues and learn the true extent of the Black Paladin's plan, he attempts to distract them with a daring attack on a museum. That leads to Act Three, An Unholy Rebirth, in which Black Paladin tries to complete his scheme to resurrect his paramour by means of an evil ritual performed at the haunted Delacroix Mansion. It's up to your heroes to bring his twisted scheme to a halt! 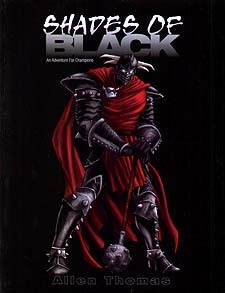 The book concludes with character sheets for the new villains, copies of the maps that appear elsewhere in the book for easy reference, a combat summary sheet, and other play aids. So get ready... it's time for your heroes to plumb the depths of evil in Shades of Black!